Saving For Your Future » Investing » Scalable Capital Review – should you trust it with your money? In this independent Scalable Capital review I will look at how Scalable Capital invests money and create portfolios together with a review of Scalable Capital's performance and its charges. Much like Moneyfarm, one of their leading competitors, Scalable Capital originally launched in Europe. 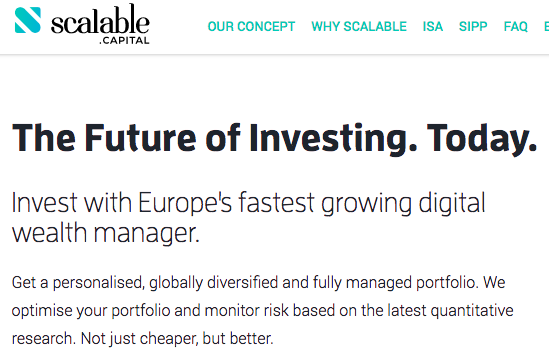 Scalable Capital started in Germany in 2016 and now claims to be Europe's fastest growing digital wealth manager, investing over £873 million of assets for its clients (£440 million coming as a result of a partnership with German bank ING-DiBA in May 2018). Scalable Capital is one of a growing number of robo-advisers that are beginning to gain a foothold in the UK market. Robo-advice is the term coined by the financial media to describe an investment proposition that is exclusively online and which typically uses computer algorithms to invest your money in exchange traded funds (ETFs). Exchange traded funds are the cheapest and most liquid form of investing in market indices such as the FTSE 100. Robo-advisors such as Scalable Capital produce a balanced portfolio for investors using ETFs and then make investment decisions on their behalf. Scalable Capital uses its own proprietary software to achieve its low-cost hands-off approach to investing. In our review last year the amount of money managed by Scalable Capital only amounted to approximately a fifth of the biggest robo-adviser in the UK at the time, Nutmeg. It has made significant advances since, thanks in part to a lucrative partnership with a German bank and now sit just behind the leading pack. The biggest difference between the likes of Nutmeg and Moneyfarm vs Scalable Capital is that Scalable Capital has a minimum investment amount of £10,000. As a result, Scalable Capital's average client has over £28,000 invested with it while Nutmeg's average client has approximately £20,000. The biggest challenge facing robo-advice firms is securing corporate backing and acquiring customers with large sums of money to invest. Scalable Capital appears to be succeeding on both these fronts, which is good news for potential customers. How does Scalable Capital work? Scalable Capital has a minimum investment amount of £10,000 and invests your money in a portfolio of ETFs across a wide range of assets. Like all robo-advice propositions everything is done online. After providing your email address you are able to start the process of obtaining a proposed investment portfolio. The good news is that you can see the exact Scalable Capital portfolio that it would suggest for you without having to provide anything more than your email address. If you want to invest money into the portfolio then you have the option to do so later. This approach is essentially a simplified version of a factfind. If you were to engage the services of a financial adviser they are obliged under current regulation to carry out a full factfind process. This is a questionnaire/interview in which they ask you a series of hard facts (how much you earn) and soft facts (what are your objectives) in order to make a suitable recommendation. When I first reviewed Scalable Capital back in 2017 this approach was novel in the robo-advice world. However, a number of its competitors now carry out a similar factfinding exercise, much like Scalable Capital's. I decided to see if I could screen myself out of Scalable Capital's investment process (i.e not be allowed to invest) based on current regulation. I'm pleased to say that the questionnaire isn't just paying lip-service to the notion of suitability as I actually managed to be screened-out by their 'factfind' as shown by the image below (click to enlarge). Investing is only suitable if you have a cash buffer in savings to support you in emergencies i.e. in the event you became redundant. When I deliberately answered that I had no cash buffer the system informed me that investing was not suitable for me. That is a feather in the cap of Scalable Capital in my view as many other robo-advice firms won't actively screen-out customers. Of course there is nothing to stop you going back and changing your answer to circumnavigate this compliance roadblock. Which of course I did. Once you've gone through the questionnaire you are then presented with a proposed Scalable Capital portfolio which I cover in more detail in the section What is 'Scalable Capital's Investment strategy' below. 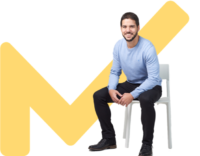 The whole process takes a little bit longer than other robo-advice firms' equivalent questionnaires but that is in part because of its robustness and customers should take comfort from that fact rather than be put off by it. In particular during the sign-up process Scalable Capital asks about the level of loss, on paper, that would make you uncomfortable. It's important that people don't just focus on the amount they could make but also the amount they could lose. This is another feather in Scalable Capital's cap as, other than evestor, I've not seen other online investment managers demonstrate this point as effectively to potential customers. The point is that investing is not for everyone and if the market crashes you need to be comfortable that your portfolio could fall in value. Scalable Capital puts your capacity for loss into context versus worst-case scenarios for a variety of assets since the year 2000. The above online application process can also be completed via an iOS app. The Scalable Capital app can also be used to monitor the performance of your portfolio in real time. What products do Scalable Capital offer? Investing in a Scalable Capital Stocks & Shares ISA allows investment in a tailor-made ETF portfolio where any capital gains and income are tax-free. Works the same way as the ISA but without the tax-free benefits. What is Scalable Capital's investment strategy? At the core of Scalable Capital's investment strategy is technology-based risk management aimed to improve risk-adjusted returns. Unlike Moneyfarm and Nutmeg less emphasis appears to be placed upon qualitative factors (human investment committees) with more faith placed in their in-house quantitative process. Scalable Capital offers a passive investment strategy investing in exchange traded funds (ETFs) which invest in various asset classes. It then adjusts its portfolios if the risk model algorithm forecasts an increase in downside risk. One thing I do like is Scalable Capital's use of VaR (value at risk). I think this is a hugely underused statistical measure in investing and attempts to quantify the worst case scenario. It is worth me quickly explaining what VaR is. VaR is a statistical measure of the likely fall in value of your portfolio over a period of time. If you took all the historical returns of an investment over a year and plotted them on a chart you would find they would group around an average with some outlying extreme results. So for example, while the average annual return for investing in equities is between 5-7% per annum. Of course there will be some years where you might make 20% or lose 20% yet statistically those extreme outcomes are rare. VaR tries to quantify that (and put those extreme results into context) by telling you that there is a 95% chance (for example) that your loss in a given year won't exceed 20%. So it's refreshing to see that Scalable Capital uses VaR to produce 23 different risk categories. Clients effectively choose one based upon the maximum portfolio loss they are prepared to accept. 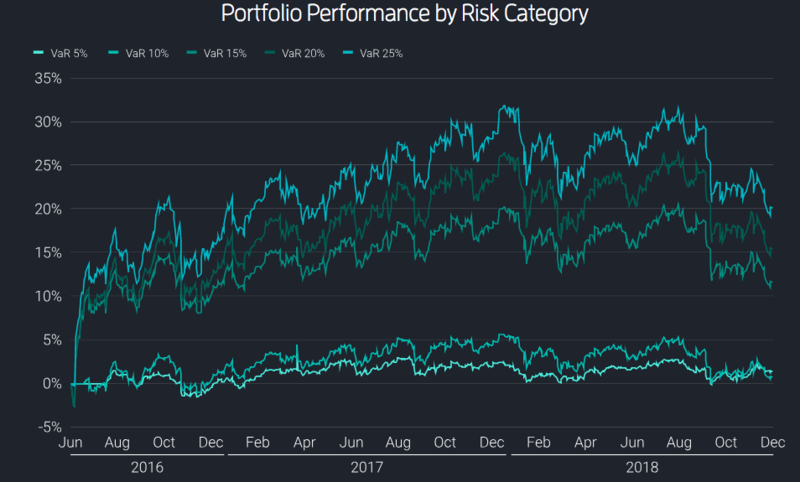 This risk level is expressed using the 'Value at Risk' (VaR) so a client selecting a VaR of 12% would have a 95% chance of not exceeding a 12% loss in any given year. Client portfolios are then created by selecting a combination of ETFs, representing different asset classes and regions, designed to maximise returns whilst maintaining risk levels that the client is comfortable with. Scalable Capital provides the most complete explanation of how their investment process works in their free ISA guide. If you download it and jump to section 9 (page 10) which is titled 'Dynamic Risk Management' it explains in much more detail than elsewhere on Scalable Capital's website how it maintains the risk level of your portfolio in order to maximise returns in both rising and falling markets. 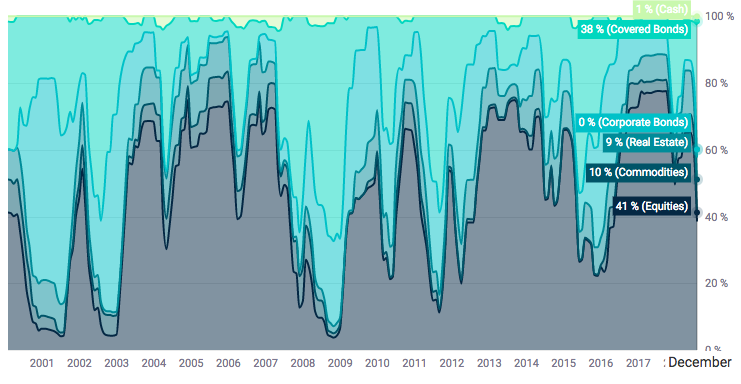 In addition, it shows how a portfolio asset mix would have changed in the years since the dotcom bubble, 19 years ago, which makes for interesting reading. How do Scalable Capital manage their portfolios? Scalable Capital's risk management model is run on a weekly basis. If its model predicts a higher loss potential than the client has specified then an adjustment to their portfolio will be made the same day. Scalable Capital believes that it is easier to predict risk, using evidence based historical data, than predicting future market movements and therefore uses risk management as the driver for their portfolio management. In other words with a focus on risk you can hopefully avoid periods of poor performance for a given asset while maximising the returns for the risks you are taking. The image below (click to enlarge) shows how your portfolio would compare to other assets in terms of risk if like me you could tolerate a VaR of 18%. The chart on the right shows the future projected returns with the black line being the most likely outcome (although not guaranteed) while blue is the result of a good outcome and red a bad outcome. You also get to see a pictorial representation of how the proposed portfolio's asset mix as well as how the asset allocation has varied over time (click on the image below to enlarge it). You can also use a sliding bar to reduce your VaR and see how it impacts the portfolio composition. Scalable Capital has only been operational in the UK for two and a half years and therefore any performance data should be viewed with that caveat in mind. The chart below shows its performance figures for a range of its portfolios since launch in June 2016 (Click on the image to enlarge it). For whatever reason Scalable Capital decided to launch its portfolios either side of the Brexit vote. There may have been reasons beyond its control as it shows a slight lack of foresight. If you look at the chart above the higher risk portfolios were launched on 20th June 2016 (3 just three days ahead of the Brexit vote). As result of the vote to leave the EU the value of the pound plummeted 10-15% which meant that any overseas assets you held (no matter what they were) were suddenly worth 10-15% more when their value was converted back into sterling. That explains the sudden spike in performance upon launch of the high risk portfolios. Alas it has little to do with great management and more to do with politics as it's the same pattern seen by any globally diversified fund out there. Unfortunately for Scalable Capital, because the lower risk portfolio were launched just after the Brexit vote (perhaps it was being cautious) they didn't enjoy this currency boost. It's going to be tricky for Scalable Capital to have to continually explain the differential going forward although it does a fairly decent job of it on its site. The point is that it was somewhat unfortunate timing. So instead I've levelled the playing field below where I look at the performance for 2018 against its key competitors. 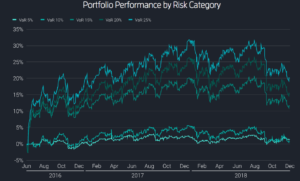 Moneyfarm once again provides the strongest and most consistent returns in the low to medium risk range (as it did when we compared them back in 2017). Of course this is a limited data range but it highlights the difference in approach. Scalable Capital is unlikely to be the top performer as it has a strong focus on risk management. The validity of its approach will only likely be tested (and potentially justified) in a market sell-off. Although the performance of its low-risk portfolio is very disappointing. When we last reviewed Scalable Capital in 2017, we noted that investors prioritising risk management over returns may accept that Scalable Capital didn't capture all of the upside in 2017 (as 2017 was largely a market that rewarded risk-taking) This still rings true with Scalable Capital producing comparably better results with their higher risk portfolios in what was an extremely volatile year for markets. What are Scalable Capital's fees? Scalable Capital charges a fee of 0.75% per year on the total amount invested, taken from investments on a monthly basis. In addition there is an ETF charge averaging at 0.15% per year. This puts it at the mid-pricing range in the robo-advisor market. Scalable Capital doesn't have a tiered charging structure which is unusual (i.e. it doesn't get cheaper the more assets you hold with it). Nutmeg also charges a fee of 0.75% a year on its fully managed service but this drops to 0.35% for any assets over £100,000, so making Nutmeg cheaper. Moneyfarm on the other hand is always cheaper than Scalable Capital as its fee is never more than 0.7% and can be as low as 0.4%. In addition, Scalable Capital has a minimum investment of £10,000 to open an account which compares to £500 with Nutmeg or Moneyfarm. What protection is there from Scalable Capital going bust? Scalable Capital is a member of the Financial Services Compensation Scheme (FSCS) with assets up to £50,000 protected under this scheme. This will rise to £85,000 from April 2019. Scalable Capital now offers advice and the initial call is free. One of their advisers will speak to you to discuss your goals and let you know how their service might suit you. Further advice is likely to come at a cost. How does Scalable Capital compare with other robo-advisors? What do customers say about Scalable Capital? Scalable Capital's focus on controlling risk (which is explained most clearly on page 10 of their free ISA guide) makes it an interesting proposition and certainly worth considering. For nervy investors worried about the stock market's vulnerability to a correction, Scalable Capital may offer an alternative to other well-known robo-advice propositions. Investors certainly would benefit from registering and seeing an example Scalable Capital portfolio and the possible future returns. The focus on risk and suitability is refreshing but investors happy with taking investment risks may still look to the likes of Nutmeg and MoneyfarmMoneyfarm. Also, both propositions are cheaper (my detailed Moneyfarm review and Nutmeg review explore both products in more detail). Combine that with the high minimum investment that Scalable Capital requires (£10,000 versus just £500 for Moneyfarm or Nutmeg) then some potential customers will be deterred. Where I think Scalable Capital could come into its own is if we see a sustained market sell-off but the proof will be in the pudding.